The first cleavage may occur as soon as 25h after insemination. The fast cleaving embryos are at the 4-cell stage on day 2 ( 44-46 h post insemination) and at the 8-cell stage on Day 3 (66-68h post insemination). As cleavages of human embryos are asynchronous, embryos at the 3, 5, 6,7 or 9-cell stage are frequently observed. 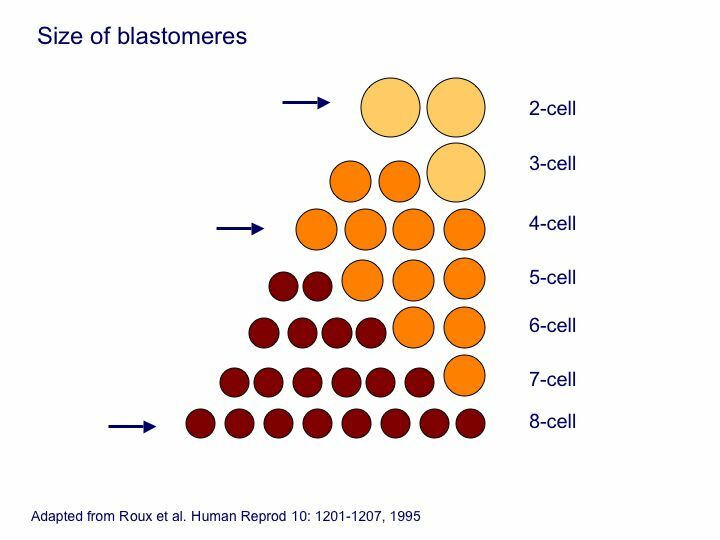 From the 2-cell to the 8-cell stage, there are 3 different sizes of blastomeres, as shown in Figure 1. Identical size of blastomeres is observed only at the 2, 4 and 8-cell stages. Embryos presenting blastomeres of different sizes at the 2, 4 and 8-cell stages are considered as uneven embryos. Embryos at the 3-cell stage with one large and two small blastomeres are even embryos. 3 states of nucleation of the blastomeres can be observed: one nucleus per blastomere, no nucleus (M-phase, before cleavage) or several nuclei (multinucleation). Multinucleation, that is highly abnormal, is better observed at the 2-cell stage. The degree of fragmentation may vary considerably and is usually expressed as % of embryo volume. Fragmentation can be separated in 3 categories: < 20%, 20-50% and >50%. The EQC test will present you several possible answers for the various characteristics of an embryo. You can make only one choice. You are certainly used to grade the embryos in your day-to-day activity, grading is a convenient way of communicating embryo characteristics both to colleagues and medical staff. In our view, this is an important parameter to monitor in an External Quality Control scheme. Embryos usually cleave giving rise to blastomeres of equal sizes. Usually, the mitotic divisions occur in an asynchronous manner in each blastomere. In embryos with 2, 4, 8 or 16 blastomeres the sizes of each cell should ideally be equal, but this might not always be the case. In embryos with uneven blastomeres (3, 5, 7, 9, 11, 13, 15) or in those containing a number of blastomeres that is not a multiple of 4, the sizes should also be different. During development of the embryo, some blastomere may expel some material, known as fragments. These fragments may vary in amount and size from one embryo to the other. Ideally, no or very little amount of fragments is visible. In extreme case, the fragments may occupy almost all space within the zona pellucida. The influence of embryo morphology on implantation is summarized in the following table. Roux C et al. Morphological classification of human in-vitro fertilization embryos based on the regularity of the asynchronous division process. Human Reprod Update 1: 488-496, 1995.